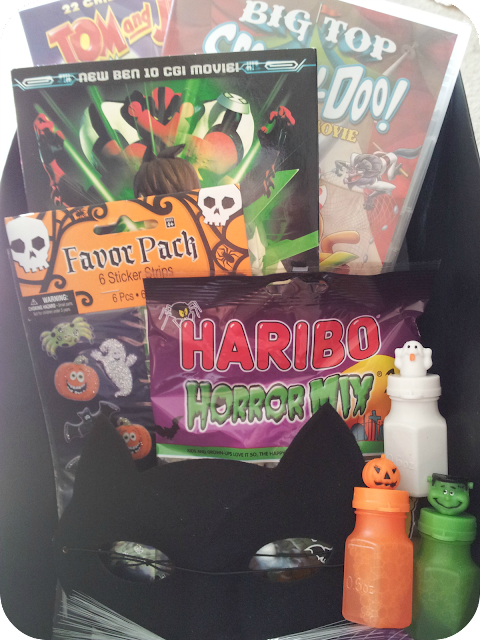 This time of year is perfect for family snuggles on the sofa with a super size blanket, some treats and a movie so this lovely delivery from Warner Bros was a super, spooky success over half term. We received a box packed with goodies including sweets, stickers, masks, bubbles and 3 new DVD releases and the Mini Mes were keen to get stuck in. This DVD has 22 cartoons, including 2 bonus episodes, featuring the famous cat and mouse with their fast and fun packed chases. Tom and Jerry mingle with a variety of eerie characters including werewolves, ghosts and witches in over 2 hours of action! It's more entertaining than terrifying seeing what mischief the terrible duo get up to as it's suitable for the entire family (rated Universal). At only £5.99 it's a great value disc to have, especially for rainy and duvet days. In this movie Scooby-Doo and chums go undercover at a travelling circus to solve their mystery. The big top is being pestered by werewolves so the gang use their puzzle solving skills to find out who's causing the trouble. This film is 75 minutes long, includes 3 bonus episodes and is rated PG as it may be a bit scary for very little ones. It is however comical in places and fun to follow their adventures - The Mini Mes really enjoyed it as did I. With this DVD comes UltraVioletTM which enables you to stream and download instantly and watch your movie on various devices including your phone. Ben Tennyson is stuck in alien form after his Omnitrix malfunctions while exploring the galaxy with Tetrax and with a mechamorph warrior on the loose his life is in danger. With great computer generated graphics this Cartoon Network favourite is bound to please all little fans... Jamster was completely absorbed! You can purchase all of these Warner Bros DVDs from Amazon and I feel that they would make the perfect stocking fillers for Christmas!